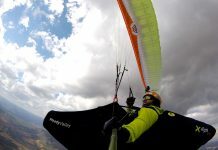 We test-flew the 'advanced' EN B model from the German manufacturer and enjoyed its nice handling and turning behaviour, along with XC performance and high passive safety. 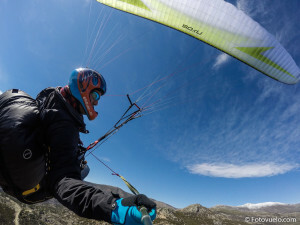 Swing Nyos, an accessible EN B wing that can also offer dynamic flying. 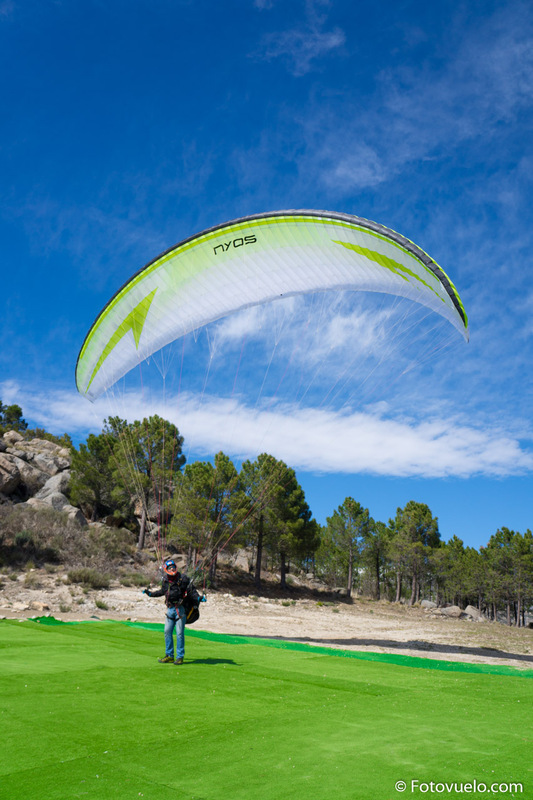 The Swing Nyos replaces the Mistral as the “high” EN B model of the German manufacturer. 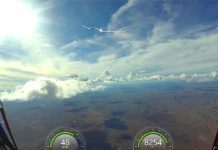 A two-hour flight in variable and technical spring conditions– with narrow, broken cores, some turbulence almost all the time and more severe wiggles here and there-, allowed me to assess the qualities of this Sport class glider. 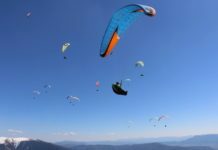 Swing’s Mistral series was aimed as an intermediate advanced wing, almost like an EN C. In the case of the Nyos we find a more homogeneous paraglider, in which we notice improvements in handling and control in turbulence. Therefore, we place it as a more intermediate EN B in terms of piloting. 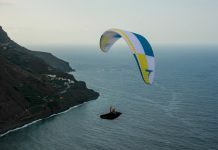 But thanks to its innovations and more advanced design, it also offers a substantial improvement in performance: it glides more, turns better and it is also more beautiful, so: Goodbye Mistral, Hello Nyos! The Nyos is practically a “softened” version of the Nexus, the C class glider of the House. It totally follows its line of design. 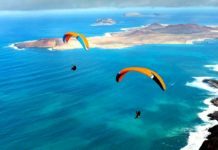 The way to fly and maneuver it is similar, with dynamic, fluid and precise turning behavior. 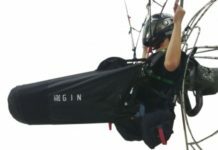 The Nyos has an aspect ratio of 5.7 against 6.1 of the Nexus, and thus it is a much more contained and accessible paraglider for pilots in progression. We did inflations with variable wind and it is easy to control the speed you want the glider to raise up. The Nyos pre-inflates perfectly and catches air at the minimum input. Consequently, you should avoid sudden movements. Any experienced pilot can control it with ease, but newbies will find it lively and therefore should have to learn to hold it over the head so that it does not overshoot. A couple of steps and you are flying; then you feel the great lift, at the level of more advanced wings. 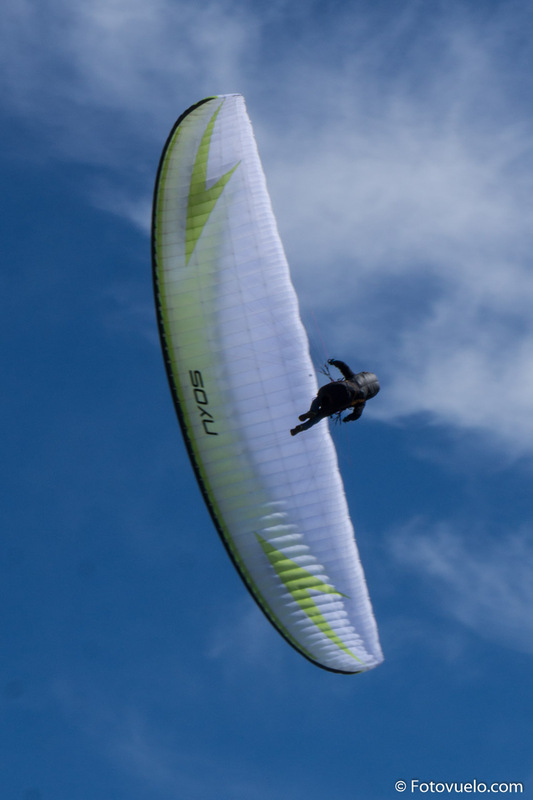 The Nyos has superb handling, at the level of many EN C wings. The brake is firm, with average travel and precise response. 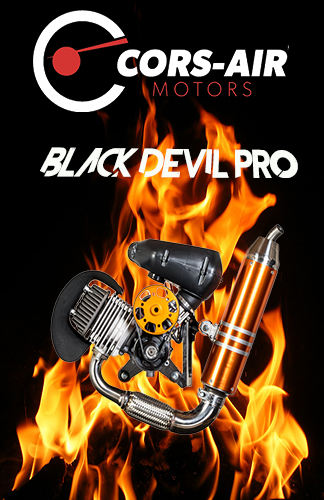 The Nyos enters the turn and keeps it going, responding in a direct way to the brake input and weight-shift control. The inherent turbulence of thermals has little effect on the wing and it is easy to keep the Nyos in an efficient climbing turn. 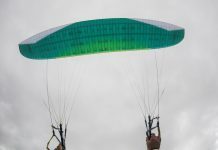 You can turn flat and wide with it, although this paraglider has a great swinging turn and in small cores is where you will most enjoy it. 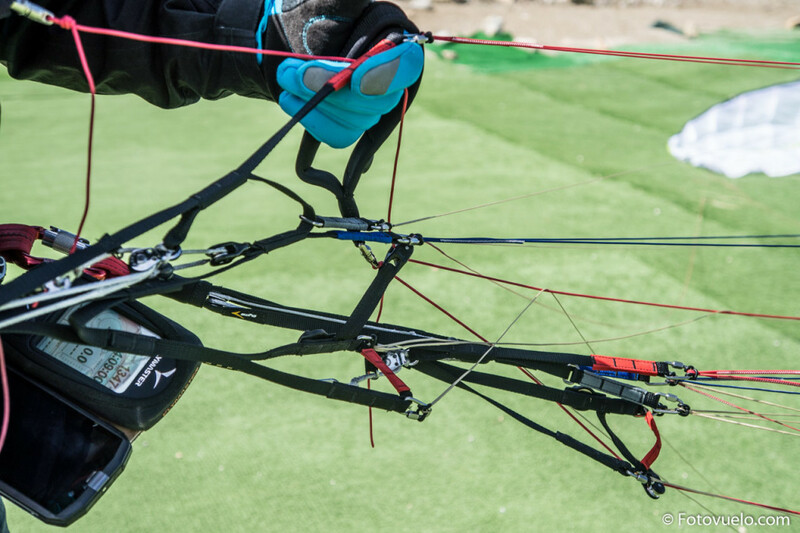 The Nyos speed bar is slightly physical and gives a good gain of speed. Up to 50 Km/h the glider is solid as a rock, while in the final bit up to 54 km/h it feels a little more “loose”; although this has more to do with sensations, as the glider offers solidity all the time and only asks for a little control with the “bridge” on the C risers. The strong and thin risers of the Nyos offer a superb look, and they also boast a unique steering system on the C risers resembling a bridge which, depending on how you pull, it allows you to change the incidence of the center or the tips of the wing. We had little time to test this feature, but we noticed that it actually offers more control, and I think it can help have a more efficient glide at speed. 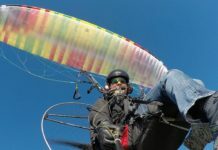 The potential of this glider for XC flight is enormous: it is agile and floaty for scratching any zero or climbing at full speed on powerful thermals; fast and solid to navigate with a +10 glide ratio with really low stress level in flight, suitable for progressing pilots, and very suitable for sport and XC pilots. 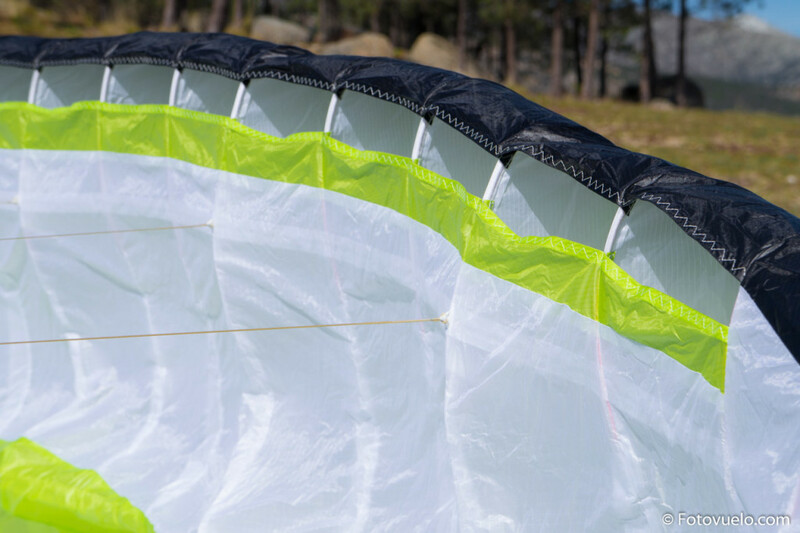 The Nyos is manufactured with 32 and 27 grams NCV Skytex fabrics, which results in a reasonably light weight of 5 kg for size M. It incorporates 3D cutting on top and bottom surface to improve the definition of the wing. The Nyos has a complex leading edge, with rods and reinforcements, but with no “shark nose”: the manufacturer chose a more vivid ‘conventional’ profile. 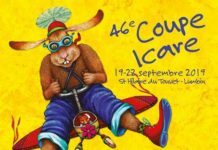 This, together with other aspects of design, contributes to its very attractive turn. The Nyos has a clean brake line thanks to the mini ribs at the trailing edge and brake system with pleating. 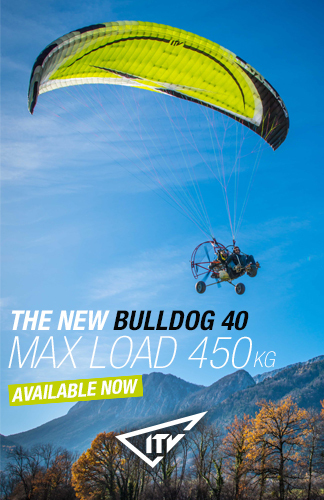 This paraglider would suit a wide 80% of pilots. It is easy enough for pilots with good hands coming from an EN A, if they progress with caution, to choose as their first EN B. A long time will pass before they feel the glider “is short” for them, it could simply never happen. 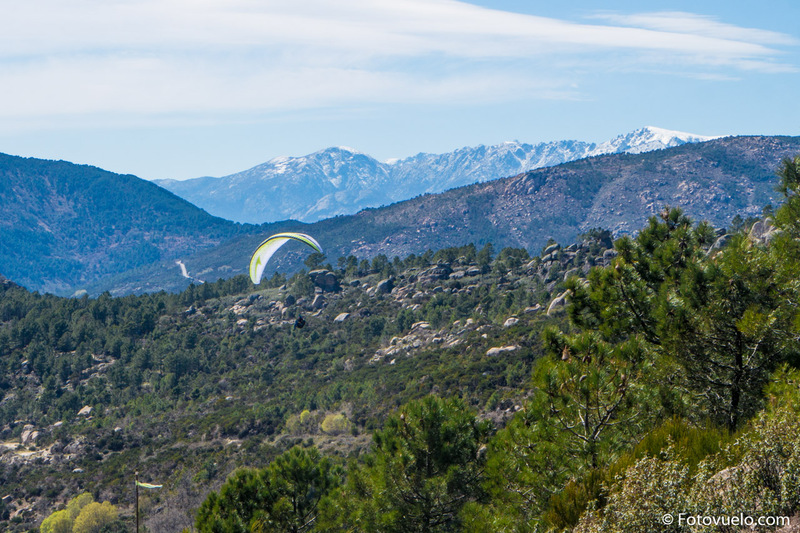 The Nyos is also great choice for XC pilots who value comfort and tranquility in flight, thanks to its good compromise between performance and safety. 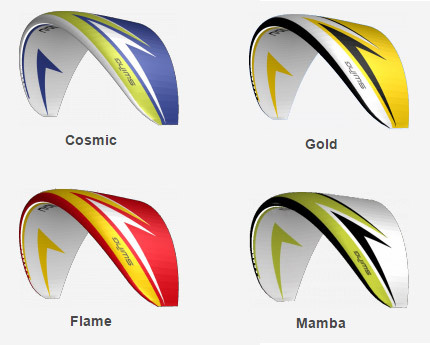 With the Nexus, Swing launched a new visual scheme in their range, introducing some curves. The Nyos boasts an elegant visual design and it is available in a range of four combinations of 3 colors. 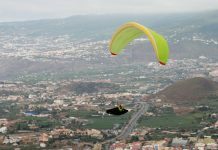 The Nyos is positioned as an “intermediate” EN B that flies a great deal, offering an outstanding turning behavior, sportive handling and high comfort in flight. It absorbs turbulence, keeps the tracks, reaches 54 Km/h, and glides over 10! It is a machine for doing good XC flights leaving the stress behind. Previous articleA summer’s evening dream: Cloudbase at 3300m! Paraglider 777 K-light: less weight, same performance. 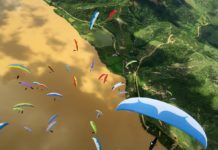 564 km: New paragliding world record of distance x 3!